The Astray Red Frame is one of the three prototypes of the Gundam Astray, the latter being the main grunt mech of the Orb Union. Each Astray prototypes has their own characteristics, with the Red having better power output. 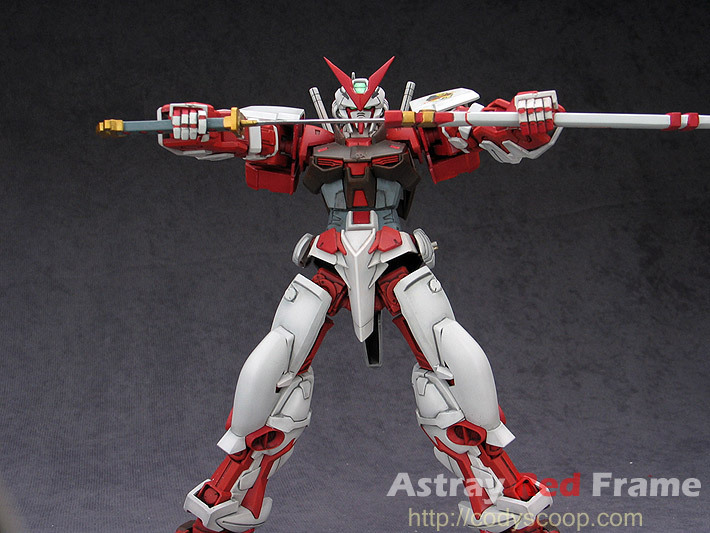 Obviously borrowed from the image of a samurai, the Red Frame sports a katana and the iconic scabbard, and a head that’s somewhat unconventional in the Gundam Universe. I LIKE IT! The “frame” part of the body has all the intricate details, surrounded by plain monochrome armor forms a very pleasant combo – unlike the very flashy red-yellow-blue color schemes of the traditional Gundams. Bandai maded a 5 minute promo video of the Astray in action. The backstory is that Lowe, a junk dealer, discovered the Red and Blue Frames in an Orb secret lab while wandering around with his team. Being a hot commodity, they have to fight their way from pursuers. The short film was actually very good action-wise (why’d you care about the story in 5 minutes! ), fully displaying the powess of the Red Frame and its cool samurai slicing action, this modeler is sold! Kit Review This kit costs and builds like an MG kit, with very articulate shoulders, and even movable waist! Everything is great except the hands, so that they can sell you the even more expensive set of resin hands.